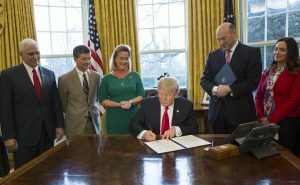 President Trump -- joined by, from left, Vice President Mike Pence, House Financial Services Committee Chairman Jeb Hensarling (R-Texas), Rep. Ann Wagner (R-Mo.) and National Economic Council Director Gary Cohn -- signs a memo calling for a review of the fiduciary rule. White House photo. Since taking office, President Donald Trump has been swift to issue no less than six executive orders and memos (and counting) that could directly impact the regulation of the banking industry. With the president stating flatly that “we’re going to be doing a big number on Dodd-Frank” shortly after being sworn in, it may come as no surprise that major news media outlets have described these early steps as a “rollback” of Dodd-Frank. President Trump — joined by, from left, Vice President Mike Pence, House Financial Services Committee Chairman Jeb Hensarling (R-Texas), Rep. Ann Wagner (R-Mo.) and National Economic Council Director Gary Cohn — signs a memo calling for a review of the fiduciary rule. White House photo. These presidential actions are certainly promising signs of a far better outlook on regulation moving forward, but labeling these administration efforts a “rollback” of Dodd-Frank does not convey much information of what will, of necessity, be painstaking and detailed work to review the whole body of laws and regulations to see what works and fix or drop what does not. The executive orders and memoranda set in place just such a process. The intent of these executive actions to help banks serve their critical role in the economy is clear, and the details of what they say and do are important to understand. In this article, we summarize some key executive actions taken by President Trump, who is now in the very early days of his term, and we explore what these actions might mean for America’s banks and particularly for the process of regulatory reform. For regulations that had not yet been sent to the Office of Management and Budget for review, the memo called for work to pause until the agency was led by new leadership appointed or designated by the president. For regulations that had been sent to OMB but not yet been published, the memo called for them to be withdrawn. For regulations that had been published but not yet gone into effect, the instruction was to postpone their effective date by 60 days to allow for review and to consider proposing a regulation to extend them for a further period to allow for “more adequate review” of the regulation for questions of fact, law or policy. There is some uncertainty as to which agencies are covered by the memo. Clearly all executive departments are reached, such as the Justice Department, Treasury Department, and Labor Department. Agencies that are a part of larger executive departments are also typically covered, such as the Treasury Department’s Financial Crimes Enforcement Network. One exception would be the Office of the Comptroller of the Currency which is housed in the Treasury Department but is treated as to some degree as an independent agency in federal law and prior regulatory executive orders. Independent agencies, including the FDIC and the Federal Reserve, are probably not directly covered, but past practice will suggest some effort on their part to comply with the spirit of the memo. The status of the Consumer Financial Protection Bureau is in some doubt, given the issues surrounding its status, not the least of which is the constitutionality of its structure as raised in ongoing appeals in the PHH court case. While not acknowledging that it applies to their agencies, officials at the FDIC, Federal Reserve and the OCC have expressed their intention to comply with the spirit of the memo. OMB, in consultation with the Office of Personnel Management, was given a 90-day task to develop a long-term plan to reduce the size of the federal workforce through attrition. That each proposed new regulation include a proposal to repeal two existing regulations. The costs (or savings via repeal) of the two regulations to be eliminated should equal or exceed the costs of the proposed new regulation. There is a two-step transition plan, one program that operates for the current 2017 fiscal year, and another that operates for FY 2018 and thereafter. The FY 2017 structure is simpler; the cost of each new proposed regulation must be matched by the cost of the two proposed for repeal. Starting with FY 2018, agencies would be bound by the regulatory plans that they are already required to publish each year. Those plans would now be required to include cost estimates for any proposal that would increase costs as well as estimates of the offsetting savings from the repeal of the two regulations that the agency proposes to link to it. From these, and related plans, OMB would develop a regulatory budget, with each agency given by OMB a regulatory cost limit that it would not be allowed to exceed. That limit from OMB may allow a net increase for the year or may even prescribe a net overall reduction. There remain details to work out and questions to be answered, but the basic program is clear, a program to regulate the regulators in a direction that points to less regulation over time. Since this is the head of the executive branch ordering how the members of the executive branch operate, with OMB in charge of administration, these are issues “within the family” that can be resolved as implementation goes forward. There was some initial question as to which agencies are affected by the order, since it provides no definition, but the White House clarified that it did not intend the order to apply to independent agencies. Moreover, the enforcement mechanism is applied through agencies clearing their regulatory proposals through OMB. Independent agencies that do not clear their proposals through OMB would not be exposed to that disciplining process. That limits the reach of the order. For example, most financial regulators are outside of that process, but not all of them. FinCEN is not excluded. Most executive branch rulemaking agencies are covered (including HUD and the Department of Labor). The application to the CFPB remains, as is the case with the regulatory pause memo, murky for now. The president issued a memorandum to the acting labor secretary on February 3, directing him to reexamine the controversial “fiduciary rule” that was finalized toward the end of the Obama Administration. The fiduciary rule dramatically broadens the definition of who is a “fiduciary” under the Employee Retirement Income Security Act and the Internal Revenue Code, an expansion that could reach into traditional bank products, such as individual retirement accounts and 401(k) plans. Any person deemed to be a fiduciary to an account under the new rule has significantly expanded duties, obligations, and liability to the account and its owner, and is subject to the so-called “prohibited transactions” provisions of ERISA and the Code. Anyone violating a prohibited transaction faces excise taxes and civil liability. Whether the fiduciary rule is likely to cause an increase in litigation or in the prices that investors and retirees must pay to gain access to retirement services. Should the labor secretary find that the fiduciary rule is harmful under any of the three factors above, or if he concludes for any other reason that the fiduciary rule is inconsistent with the priorities listed in the memo, then he is directed to issue a proposed rule that would rescind or revise the fiduciary rule. Pursuant to other memos, DOL has already proposed a rulemaking to delay the fiduciary rule’s implementation date by 60 days. The American Bankers Association has filed a letter supporting the extension while also recommending that an additional 120 days be provided in order to make changes to the rule or issue a regulation to repeal it. Also on February 3, the president signed an executive order setting out seven core principles for regulating the financial system. This is the most directly relevant executive order to the banking industry, though nothing within this order itself mandates burden reduction or less regulation. It lays out the process for reviewing regulatory burdens and creating the factual basis for specific regulatory reforms. Enable American companies to be competitive with foreign firms in domestic and foreign markets. Advance American interests in international financial regulatory negotiations and meetings. This executive order operates by directing the treasury secretary, as chairman of the Financial Stability Oversight Council, to consult with the heads of the member agencies of the FSOC and draft a report to the president due no later than June 3, 2017. This report will analyze the current laws, regulations, reports, guidance, and treaties for their consistency with the president’s core principles. As an initial step, ABA is preparing a series of white papers on key issues to help inform the Treasury Department’s work and offer solutions that can provide the banking industry meaningful relief. On February 24, the president signed an executive order on “enforcing the regulatory reform agenda” that gives 60 days to the head of each agency to designate an agency official as its “regulatory reform officer.” This officer is to oversee the implementation of several other regulation focused executive orders, while also chairing a newly created Regulatory Reform Task Force in each of the respective agencies. These task forces will evaluate their agencies’ existing regulations and make recommendations regarding their repeal, replacement, or modification. It is currently unclear whether the White House intends this executive order to apply to independent agencies like the banking regulators. Past actions by the White House suggest that further clarification could be forthcoming, while past practice by the banking regulators suggests they will undertake a good faith effort to abide by the spirit of this executive order. Any effort to identify burdensome rules enforced by the banking regulators, however, is likely to be undertaken by agency leadership that is in various stages of transition since the election. President Trump’s early executive actions are a welcome set of initial moves in the direction of reducing regulatory overreach, duplication, and overgrowth. The hard work of getting into the details remains. The banking industry must play a significant part in that effort, as no one knows as well as bankers do which rules and regulations and provisions of law are inhibiting banks’ ability to serve the financial needs of their customers. The power of any one person, even the president, to rewrite the regulatory rulebook is limited. The ambiguous application of these executive orders and memos to independent agencies such as the federal banking regulators also makes it hard to predict the extent of their impact on the banking industry. Uncertainty about the future of the CFPB, a source of major regulatory burden since Dodd-Frank’s enactment, further clouds the forecast at this moment. 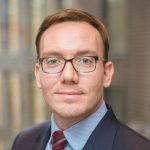 The terms for the officials currently leading the federal banking agencies and other select agencies of interest to the industry are set to expire at different points over the next 18 months, and President Trump’s chosen replacements will have considerable sway over the future bank regulatory landscape in ways we cannot yet predict. As these developments unfold, ABA and its members will need to engage actively with policymakers to help them understand what can and should be done to facilitate the ability of banks to enhance their role in promoting economic growth, a goal that will meet the financial needs of our customers and communities. Wayne Abernathy is EVP for financial institutions policy and regulatory affairs at ABA. Shaun Kern is counsel in ABA’s Office of Regulatory Policy.